It’s always challenging to get small children to eat more fish. Luckily, apart from fish and chips and fish fingers there are plenty of other yummy options to get them to eat fish AND veggies. Sounds too good? 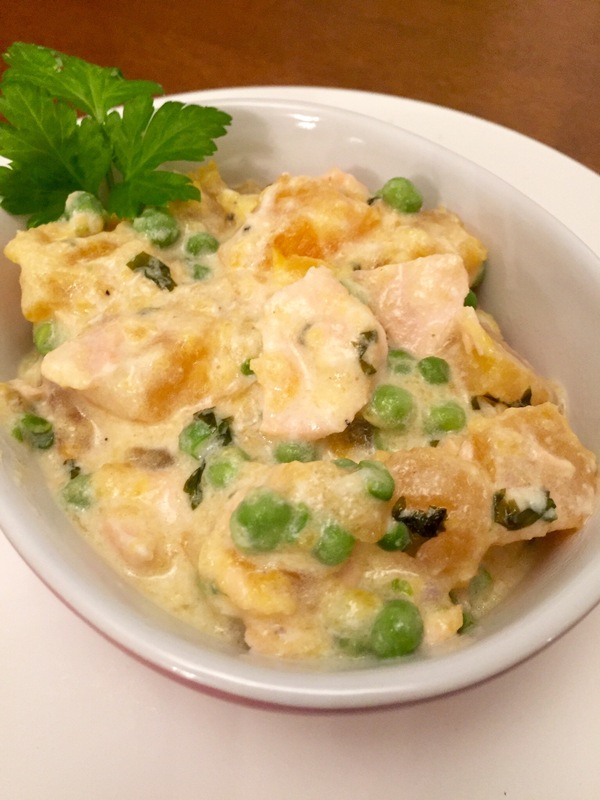 This recipe is always a hit for my 19 months old, he loves sweet potato and tolerates salmon and petit pois. The cream cheese makes it mushy and really tasty. Also, it’s super easy to prepare. The recipe below will allow you to prepare 3-4 toddler size portions. Freezes very well. Make sure the cream cheese doesn’t contain any nasties such as different stabilizers. Put the cubed sweet potato into a roasting dish, sprinkle it with some olive oil, cover it with aluminium foil and roast them in the oven for about 30 minutes, or until they are soft enough for your little one. In the meantime put the cold milk into a pan with the salmon, the petit pois, parsley and the stock cube and on very low heat and start to cook them. Stir it frequently, the milk can over boil very easily. Once the salmon is cooked, add the cream cheese and simmer it for a further 5 minutes on low heat, stirring it frequently. Start breaking the salmon into small pieces with a wooden spoon, no need to remove it from the sauce. Once the sweet potato is cooked, combine them well, and it’s ready to serve.